The fully-featured and easy to setup Achromic AS8 system comprises an active 8-inch subwoofer enclosure alongside two column units. One is loaded with six precision-aligned 2.75” speaker cones while the other serves as a spacer to lift the speaker column up to optimal height. 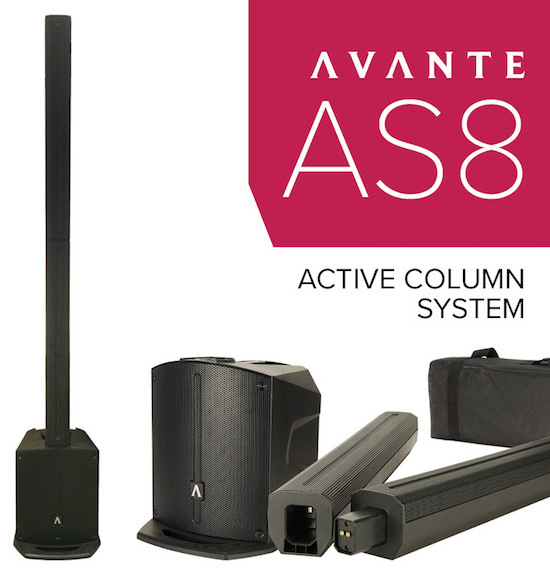 Both feature Avante’s new SAM (Secure Array Mount) system which allows the columns to lock securely to the sub and to one another without risk of being toppled over. The SAM connection also passes the audio signal from the sub up to the columns, removing the need for speaker cables, and allows the main column to connect directly to the sub without using the spacer if required, ideal for performances from a high stage. Featuring a Class D power amplifier with built-in limiter that delivers 800W of power, the sub unit also integrates a flexible three-channel mixer with 2-band EQ. This allows direct connection of line-level audio sources as well as microphones and even a guitar, making the system ideal for acoustic solo performers, duos and even small bands. The unit is also equipped with a Bluetooth audio connection that allows wireless streaming of music from a smartphone, tablet or laptop. The lightweight system can be easily transported in a small car and is supplied with a padded bag for carrying and protecting the column units. This makes it the perfect system for DJs as well as live musicians playing in small venues such as coffee houses and lounges. Weight: 28.6 lbs. / 13 kg. Weight: 50.6 lbs. / 23 kg. Weight: 39.6 lbs. / 18 kg.